Danny Siegel, Ph.D. will lead a discussion of Middlemarch by George Eliot. Join the Department of English for monthly Booktalk meetings 6-7 p.m. the first Tuesday of each month in Humanities Building Room 237. The meetings are open to the Birmingham community; all are welcome. Books are selected by English faculty and instructors, who also lead the discussions. Discounted copies of all titles will be available at Little Professor Books in Homewood. Just mention UAB Booktalk when purchasing. Join us for a reading group discussion of MIDDLEMARCH by George Eliot! This panoramic work – considered the finest novel in English by many critics – offers a complex look at English provincial life at a crucial historical moment, and, at the same time, dramatizes and explores some of the most potent myths of Victorian literature. The CENTRAL SF CLASSIC LIT BOOK CLUB will discuss Books VI-VIII of MIDDLEMARCH by George Eliot. 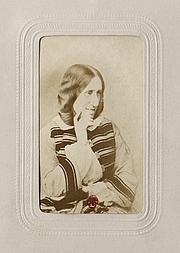 George Eliot is currently considered a "single author." If one or more works are by a distinct, homonymous authors, go ahead and split the author. George Eliot is composed of 16 names. You can examine and separate out names.